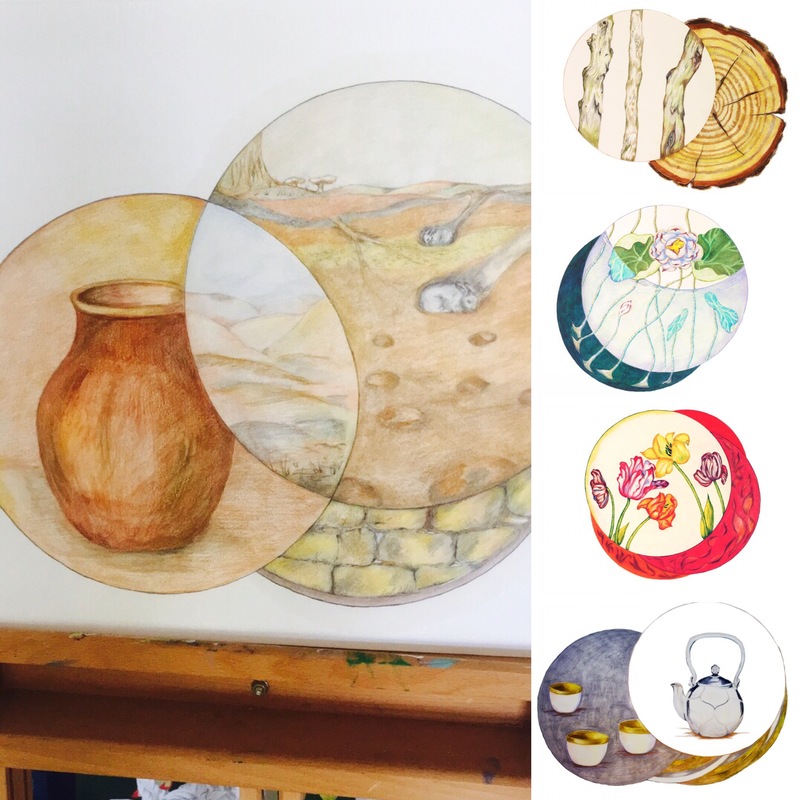 This are Feng Shui’s 5 Elements: Water, Earth, Metal, Wood and Fire, drawn as artistic interpretations by Paula Kuitenbrouwer, Dutch nature artist living in Ireland. 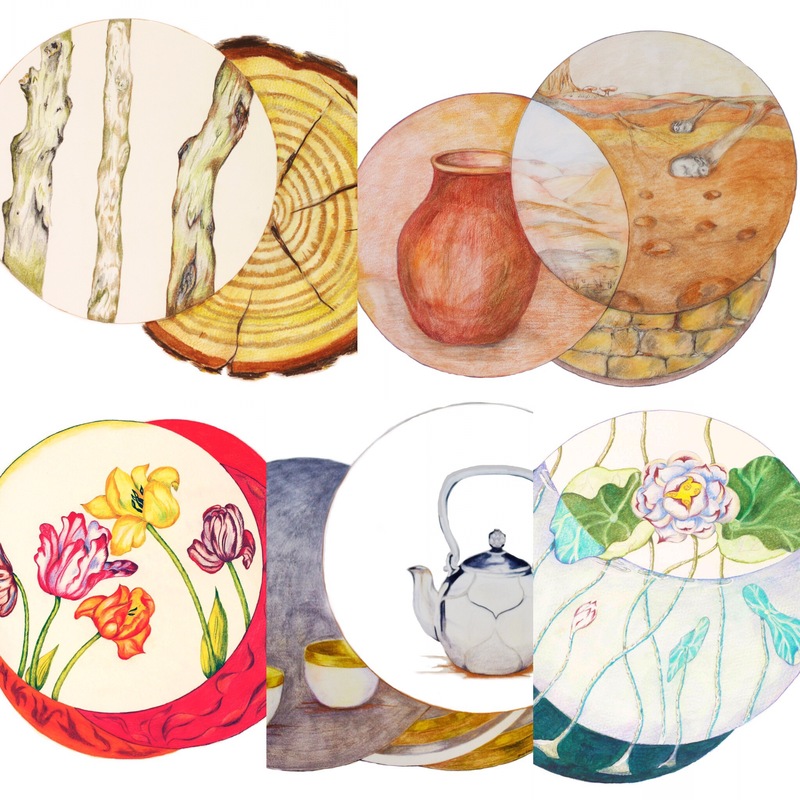 These circular compositions, that are printed on high quality art paper with light-fast pigments, show exquisite details and skill. They can be used at home, for Feng Shui workshops and in office rooms. They are engaging, invite exploring of your ideas about what are elements, what do they represent and which role do they play in your life. Are they in balance in your life, in your home, in your work-place? As from ancient times philosophers discussed the elements of life. What were the building blocks of life? Many manuscripts were written on the elements of life, some adding air, aether and void as an element too. Today the best known elements are for school students the periodic table and to Feng Shui specialist the 5 ancient Taoist elements. Water: Paula has drawn a cut through that shows water in a pond. As water is so minimal visible, it is the lotus growing in the lotus pond that shows indirectly a body of water. Wood: Again Paula uses a cut through, showing the growth rings, representing wood. Counting the growth rings of a tree is a way to tell how old a tree is. Earth: Next to a cut-through, that shows soil and dirt layers, Paula shows how we use dirt since prehistoric times, to make ceramics and to built stone walls. This is a solid drawing representing the grounding and soil character of earth. Fire: There are flames in this drawing, in one of its outer rings, but Paula prefers the fiery petals of red tulips to present the fire element, its passion and its dominant red colour. Metal: Paula shows a beautiful silver teapot with white-washed and golden decorated tea cups. This drawing is done with Derwent metallic coloured pencils using Bronze, Gold and Silver. It works: the print shows a metallic shine that communicated the metallic element. Frame this drawing with a metallic frame and its crisp white background works effectively. For a healthy, harmonious, and beautiful atmosphere in your home. Paula Kuitenbrouwer is owner of http://www.mindfuldrawing.com and can be found on Instagram as @mindfuldrawing.